Some of you will know that my wife and I moved to County Durham in January and, in order to make room for new things here, it was necessary for me to lay down the project leadership. It is also impractical to lead the project from England! 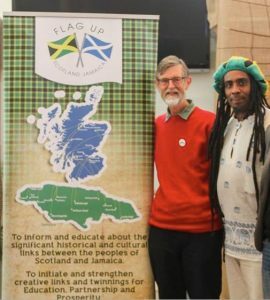 Graham is a Jamaican who has lived in Scotland for 14 years and he has been very active in Flag Up since we started in August 2014. He is an excellent team player with great networking skills. He knows so many people in both Scotland and Jamaica who will be part of moving the vision of Flag Up Scotland Jamaica forward. Of course it is also ideal that he is a member of the Jamaican Clan Campbell! I think one of his priorities should be to organise the first ever worldwide Campbell Clan Gathering in Jamaica! We hope later to set up charitable status so that donations can be gift aided. Thank-you so much for your support of me during this first chapter of Flag Up Scotland Jamaica. could I purchase a flag up Scotland Jamaica logo? Sticker or otherwise? We may have some badges still available. We’ll check and let you know. I am related to a William Paterson of Braehead/Kilmarnock Ayreshire (1755-1832) and am interested to know if you have any record of this person? He made his fortune in Jamaica. Hi Robert, unfortunately we don’t have any record of William however a quick search of the Jamaican Family Search website has shown up documents containing references to William Paterson during this time period in Jamaica. Difficult to tell if it is the same one you are looking for however. A wee bit of internet research may be the way to go.